Facebook, the site where members carefully curate memories of life’s most important milestones, announced Thursday it will allow users to put their online affairs in order and decide what happens to their profiles once their status can no longer be updated. Users will now be able to designate a legacy contact, a Facebook friend who will manage their account once they pass away. The heir will be allowed to write a post at the top of the timeline, respond to friend requests and update the profile picture and cover photo of the account. The contact will not be able to see the user’s private messages, delete photos, edit existing posts or delete the entire account. The company has also added the word “Remembering” over the name of the deceased user. Facebook is the latest internet company to grapple with what should happen to the heaps of data, emails and photos of users once they die. In 2013, Google became the first company to announce a similar policy. 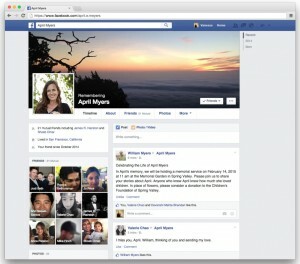 Facebook previously memorialized accounts of users who have passed away, meaning the account was viewable but the photos and profile could not be changed or updated. The policy angered some who wanted to edit the user’s profile after they died. “By talking to people who have experienced loss, we realized there is more we can do to support those who are grieving and those who want a say in what happens to their account after death,” the company said in a statement. The option will be available in the United States first and then expand to other countries. The new setting, however, is optional. If users chose to do nothing, their accounts will be frozen and their privacy settings will remain as they once were.